Riley: Hi Laurie! I am really happy to have you here at Whiskey With My Book to talk about the SFR Galaxy Awards. Laurie: I’m so happy to be your guest today. Thanks for inviting me. Riley: First, please tell us a little about yourself. Laurie: I’m a science fiction romance author who’s best known as the founder of the SFR Brigade community of science fiction romance writers and authors. Riley: What is your involvement with the SFR Galaxy Awards? 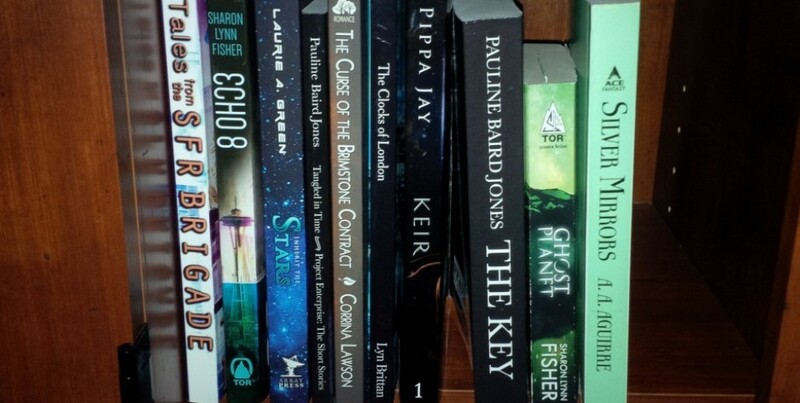 Laurie: The SFR Galaxy Awards were the brainstorm of peer and fellow author Heather Massey, who has always been a terrific supporter of science fiction romance. Early on, I assisted Heather in getting the awards rolling by creating the awards site, and also served for the first few years as a judge. After I published my first SFR books in 2015, I felt it was time to step down and let another reviewer or book blogger fill the niche. For the upcoming award cycle, Heather anticipated a possible scheduling conflict with some real-life priorities, so asked if I would be willing to step in to host the 2017 awards. I was more than happy to help. Riley: Why should people be interested in the SFR Galaxy Awards as opposed to any of the many other ‘Best Of’ opinions out there? Laurie: The SFR Galaxy Awards are unique in that they strive not only to recognize standout books in the genre, but also to help readers find books that they might enjoy reading. That was the original premise for the awards, because SFR is a hard to find but diverse genre that often presents a challenge for readers in locating books that intrigue them. Our panel of judges are all prolific readers and several have review sites of their own, like Whiskey With My Book. Riley Moreland — that would be you! Readers can learn more about the judges and see their site links or other contact information on the SFR Galaxy Awards Judges Page. Riley: How did the awards get started? I wish we gave literary prizes freely, the way they used to give prizes at the Pet Show at Codornices Park in Berkeley when I was a kid. Every kid in the neighborhood brought their pet, and every pet got a prize, an ad hoc, unique prize: for Soulfulness — for Loud Meowing — for Unusual Spot Placement — for Being the Only Skink…. There was no Best of Breed …and certainly no Best of Show. That gave Heather the spark that ignited the flame for the SFR Galaxy Awards. She ran the idea by me and I loved it. We collaborated to get the awards rolling, and cover artist Kanaxa was kind enough to create the SFR Galaxy Award icon for us, gratis. Danielle Fine, another cover artist and book editor, also designed several banners for the awards site, free of charge. Riley: Not counting any that you have personally won, do you have a favorite award or two that you can mention? I get pretty excited when I find a book that checks all my boxes and this particular story was all that. Riley: When will the 2018 SFR Galaxy Awards be handed out? Laurie: The awards will be announced on January 31st on the site (link posted below). They will be presented in the traditional way, with one round being posted per hour beginning at 9AM (blog time). A “round” is comprised of at least one award–but usually multiple–presented by an individual judge, and in total there could be around thirty-five awards presented. It varies from year to year. Riley: What is the best way for someone to make sure they don’t miss these fabulous awards? Links to the awards rounds will also be posted on the SFR Brigade FanPage on Facebook and tweeted with the hashtag #SFRGalaxyAwards. Thanks so much for hosting me today to talk a little about the SFR Galaxy Awards. It’s always an exciting day for SFR authors, readers and fans. Laurie A. Green is an award-winning, USA TODAY bestselling author, and a science fiction romance enthusiast who founded the SFR Brigade community of writers. Here’s last year’s USA Today/HEA post on the JAN 2017 honorees and the ‘spark’ for their stories: http://happyeverafter.usatoday.com/2017/02/08/sfr-galaxy-award-winners-share-their-story-inspirations/ I hope that’s ok to mention! Thank you for sharing your USA Today post Veronica! Special thanks to you, Veronica, for all your help in getting the word out. It’s been a huge boost for the visibility of the awards. I love the awards and always look forward to following them! Thanks, Pauline. It’s always fun to see how well the awards are received by authors and fans, alike. I look forward to these every year, because they help set my reading schedule for the next month as I try to catch the ones I’ve missed. They definitely add to my TBR pile too, JC.